This quilt took 3 days to make…the quilter 1 week to quilt…and 6 weeks for me to get the motivation to bind it. Geesh. I’m so glad I finally found that motivation though because I love it. The backing is a flat sheet. I get lots of questions about using flat sheets as backings. I buy them when I see single flat sheets on sale if they are good quality, then I wash/dry them and trim off the edges. It’s a heck-o-lot cheaper than buying designer yardage and if you buy nice sheets they feel the same or better. The quilting was done by my friend Kathy. She did that freehand…which requires a lot of patience…which is why I am not a long arm quilter. It adds such a beautiful texture to a super simple quilt. If you need quilting she is affordable and fabulous. The tutorial and a photo of the whole quilt top can be found here. 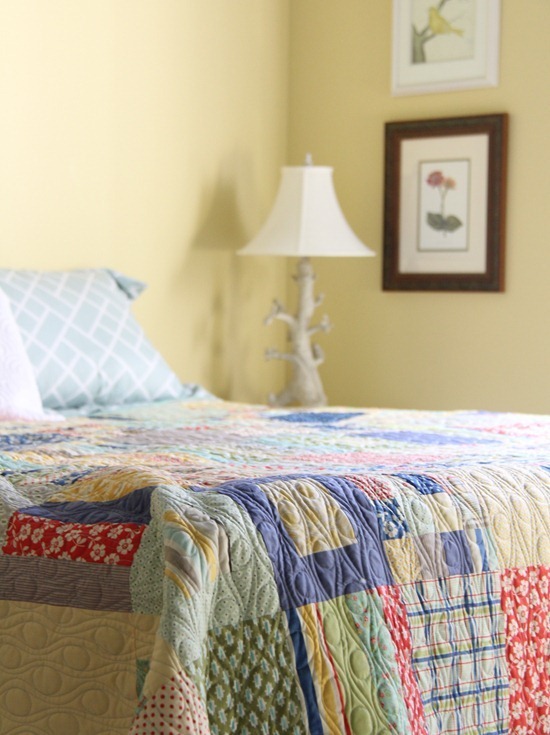 You have such a wonderful eye for color and pattern – I love the way this simple quilt turned out! Lovely. Beautiful quilt. I have yet another question. When you buy sheets for backings, do you look for a certain thread count or worry about what it's made from (cotton, poly, etc)? Does your prep, whether you prewash the sheets, depend on whether the fabrics in the top are prewashed or not? Kathy does such beautiful work! Beautiful! thanks for the reminder tip on the sheets – great excuse to buy some linens! Woohoo! but at the end of the day..
PS… I use sheets for backing as well! That quilting pattern suits the quilt perfectly. Absolutely gorgeous. Love the patchwork. Love the quilting. I also use flat sheets for my backings. i can attest to how quick and simple making this quilt top is…i cut and sewed all the individual block units in one day. now i need to compose and assemble the quilt top. i love the quilting pattern on yours, very nice contrast to the squares and strips of the piecing. thank you for sharing the cutting directions. Holy cow, I love the quilting! That is breathtakingly gorgeous! Makes me so motivated to try making a quilt myself. I absolutely love the quilting pattern. It adds a lovely dimension to such a beautiful quilt. I love this quilt! My youngest son has been wanting me to make him a quilt but I couldn't decide on what to make…until now! I'm always thinking I need to use an actual patterned quilt instead of just creating one. I will have to be more creative. Thanks for the beautiful idea and I love the colors you chose. WOWEEE I love this quilt! The prints,the pattern, the quilting…mmmmmmmm. This is beautiful. I really love the Seaside fabric. I really must buy more. Eh, sometimes that's the way it goes. I've got 5 quilts stacked up right now that need binding. Once it cools off, I might just hole up for a weekend and have a binding marathon. 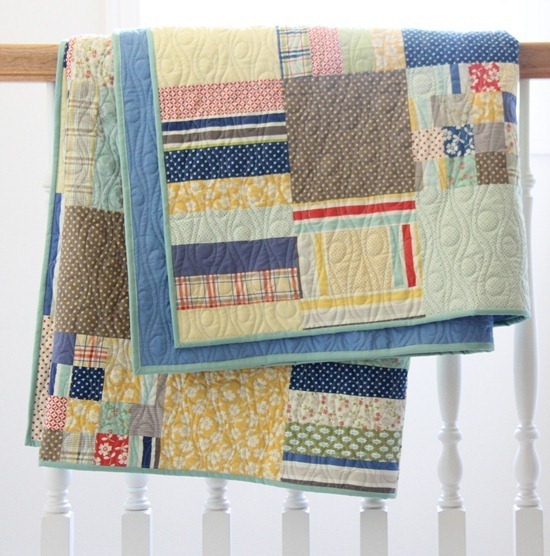 Those fabrics are perfect for this quilt pattern, and your quilter is amazing! Wow, do I ever like this quilt! And the quilting is just amazing! This turned out beautifully! I absolutely love it. awesome quilt indeed, and the quilting is amazing too! I use flat sheets as backing for quilts, I use them from sheet sets since we don't use the flat sheets anyway, and then I even have a matching quilt-back! OhMyGoodness!! The quilt is gorgeous and that may be my most favorite-ist long arm quilting EVER. I never considered sending one off until now! Allison I love your quilt and quilting and just happen to have a fat quarter bundle of Seaside ~ Your quilt is just perfect for this fabric. Thanks so much for the tutorial!!! Wow, this quilt is just so so pretty! I do love the quilting pattern your friend did. The photos are so beautiful – you always give us so much information, patterns and share what you are passionate about. LOVE the binding choice! Beautiful post – thank you!!! 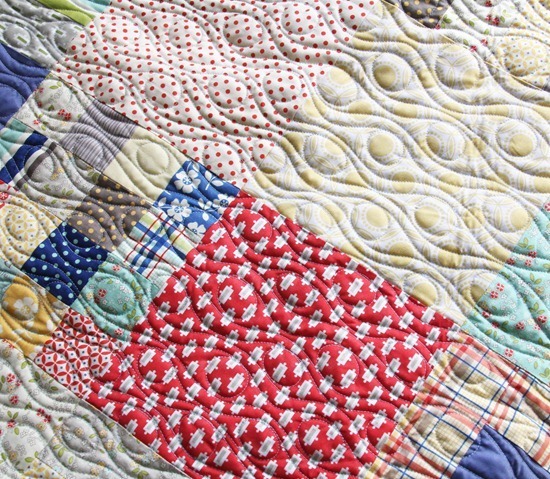 Love the fabric, love the pattern, love the quilting! LOVE it. I have a charm pack of that fabric–can't wait to use it. Absolutely beautiful, I LOVE the pattern on the quilting. What kind of brands do you buy of sheets, thread count, etc. That would be so much cheaper than 10.50 a yard. Thanks. The quilt is really pretty and the quilting really shows it off. She did a terrific job. Love the quilt. the quilting makes the quilt look really different. It's a wonderful design that I wouldn't have chosen but I love it. Maybe I'll try it on a pillow or mug rug or whatever small. I like the pictures of the quilt on the bed. The colours, the quilting and the way it looks. Another of your quilts going on my to do list!!! Looks amazing! I do lovelovelove this quilt! I went to your tutorial and found it so well presented that I am going to get me some FQs and start cutting right now! Thank you! Another beautiful quilt I now want to make!! I love the quilting on that one! Lovely as always, and that quilting is great! Super cute, and love the quilting too. She did that quilting freehand. Wowzers! This is lovely … I love the quilting design too! love the quilting. the combination of waves and circles. nicely done. This is beautiful and you are correct, the quilting is lovely. I have bookmarked Kathy for future reminders when I need a long armer. I love this quilt pattern, and thank you so much for the tutorial. I bought the full FQ set of this fabric a while back to make a quilt for my bed, love the low key fabrics mixed with the brights. I was waffling around about what pattern to use, and this is perfect. I have some other fabrics that will go with this collection, not to mention 800 or so 2 1/2" squares I cut last weekend to use up some strips and scraps, so now I'm excited to get started. Thanks also for the tip about how to use a bed sheet for the backing. I saw some of your patterns in our local craft store quilt fabric section, made me happy to see them there. 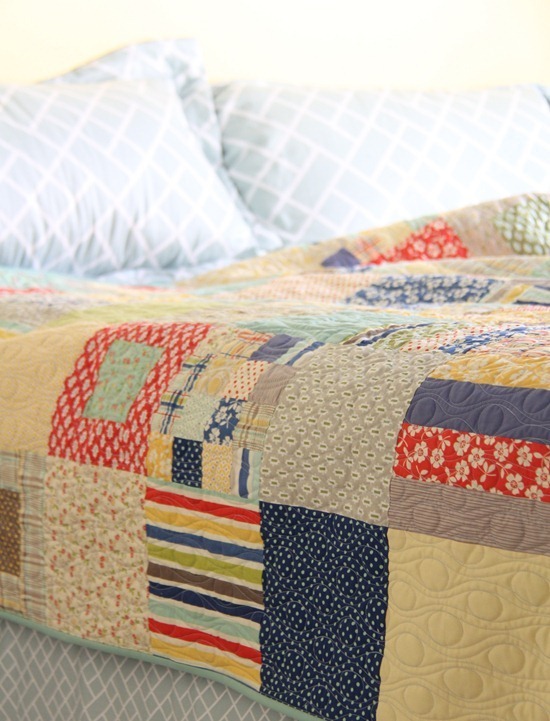 love the soft dreamy look to this quilt….simply stunning! What lovely colours – it looks so soothing. I quite like using plain cotton for quilt backs with a few leftover scrap blocks stretched across the middle – I'll have to try it with sheets the next time I need a good backing, thanks for the top tip. I love this quilt. The fabrics and colors are fabulous. This is really a wonderful quilt in its simplicity. I have never used a sheet as a backing but it sounds like a great idea! It is absolutely gorgeous and the quilting is different and really adds to the overall design. What a gorgeous quilt. You must have spent a lot of time making it. Your hard work was all worth it. Just screams summer. :) Love it. Simply gorgeous, I love the colours and the quilting is lovely. Wow! Great quilt and beautiful quilting :-) Lovely finish! I love the way this turned out! I just finished making a quilt top using your tutorial. Here's my version of the seaside quilt – thanks for the inspiration!